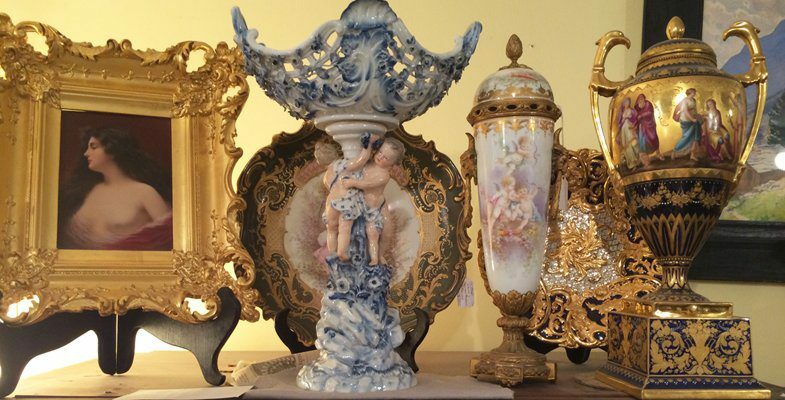 Elegant Findings Antiques specializes in fine antique china from Europe. We carefully choose each piece of antique china for its beauty, fine detailed artwork, great condition, and its rarity. We have an extensive selection of antique china and dinnerware from all the fabulous porcelain companies like Meissen, KPM, Dresden, Royal Vienna, Sevres, Limoges, Paris, Minton, Coalport, Royal Worcester, Royal Doulton, Royal Crown Derby and many more. You can count on our 30 years of experience to help you choose the finest dinnerware, decorative pieces and cabinet treasures for your home. Please browse our dozens of pages of antique china selections to find exactly what you are looking for. Click on any of the antique porcelain companies above to start your search. Most of our sets of antique china are hand painted with different paintings on each plate or vase or other items. The painters spent their whole lives working for the different famous porcelain companies. Each artist became known as artists specializing in painting flowers, Marine scenes, landscapes, fruit or scenes of people. Other artists specialized in gilding the porcelain pieces with decorative gilding. This is why you find the finest quality painting on the antique china. We have one of the largest selections of Meissen porcelain. We find it has a superior quality that is beautiful and lasts for a long time without showing signs of use. We have selections of purple Indian Meissen, streublumen Meissen , blue onion Meissen, large flower Meissen with and without insects painted on it as well as Chinese butterfly Meissen. Please go to our Meissen section to view our large selection. We have made this new website to be mobile friendly for the convenience of our customers. We will keep our original website at elegantfindingsantiques.com until all of you have found this website.